Crystal's Crafty Creations: Give up Eternity for You! Give up Eternity for You! Today I wanted to share a card with you that I made after seeing Eclipse this weekend. WOOHOO What a GREAT movie!!!! I am definitely TEAM EDWARD but after seeing this movie Jacob sure is making it hard on me....LOL!!! I decided to use this ADORABLE Edward image from The Greeting Farm and combine it with this cool stamp set For-Bitten by Our Craft Lounge!! Hope you enjoy my card today! Thanks so much for stopping by today and I hope everyone has a cool Wednesday!!! I hear the temps are crazy hot in soooo many places!!! Ohh he is so HANDSOME!! What a little hottie! Great card, Crystal! I'm a bit jealous - haven't seen the movie yet :) Happy Wednesday! Adorable card! I'm so torn between team Edward and team Jacob! 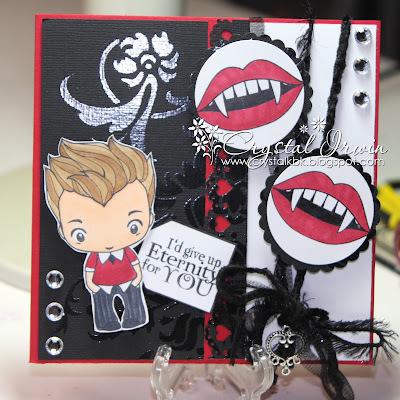 WoWzA, Crystal, this is the coolest 'Twilight' card I've seen! Love the images ... and your coloring ... this is just awesome, girl! Yum, gorgeous card!! Definitely team Edward all the way but I do like Jacob and Taylor is definitely very gorgeous but......I just can't get past Edward and Robert lol :) I haven't seen Eclipse yet though sob so don't know what you have seen! Oh how fun Crystal!! I can tell you had fun creating it. Haven't seen the movie but your Edward rocks!! Awesome coloring and design! What a hoot!! I LOVE your card. DD has seen the new movie twice already, and says it's the BEST!! TFS! What a fun card! I love the fangs and the sentiment. So cute! oh how cool are these! i hear the movie rocks too. i love those fangs!!! my DIL would go ga ga over them - well a card with them anyway. may have to treat myself!! Fantastic Crystal....what a fun card - love the "big bites" and the fun accents of the heart charm and bling. Well done, my friend. OK...so you KNOW I LOVE this! LOVE LOVE LOVE this! GORGEOUS girlie!! OM Gosh this is sooo adorable Crystal!! I LOVE that image! The charm and fibers are awesome!! BTW, I just discovered the card I had THOUGHT I had put into your package under a pile of scraps. So if you're gonna get a packet from "posters anonymous" - that'll probably be me!!! Oh wow, how dramatic is this! Love the card, Crystal, even if I'm not a Twilight fan! Super cute. So odd to me to have everywhere else be so hot when we're in the 90's. Usually this time of year we soar to 110+....stay cool! He looks awesome!!! Love what you've done with this card Crystal! Oh this is awesome!! I went and seen it last night and I'm with ya on Jacob giving a run for the money! When they showed him shirtless leaning on the truck, the theater went nuts! I think I just love the whole "Bella/Edward" love story, but man...Jacob's a hotty too! LOL! I have to say, I'm now on the team fence! LOL! I must say that it really was an awesome movie and I just love both Edward and Jacob!! What an adorable card and perfect sentiment! What a great image. super colors. Your card is so cool, Crystal! LOL Oh you twilight fans crack me up. Very *festive* and cute.